Update: It's a do-over. They will hold another one at later date. As noted earlier, the county delegates to the Nevada state convention were to be selected today. Those selected at local caucuses aren't binding. Both the Obama and Hillary camps did their best to get their delegates out today. Most primaries and some Democratic caucuses are binding, meaning that national delegates won by the candidates must pledge to support them at the national convention this summer. Some high-profile caucuses, however, are just the beginning of a multistep process of selecting national convention delegates. In Nevada, precinct caucuses were held Jan. 19 to select delegates to county conventions this weekend. The county conventions will select delegates to the state convention in May. The national delegates are elected at the state convention — the third step of the process. If all the delegates for each candidate show up at every step, the national delegates awarded Jan. 19 will remain unchanged. In Nevada, Obama won 13 delegates and Clinton won 12. Supporters of Barack Obama continue to spin the 13-12 delegate count story as if it proves he won in Nevada. Their sour grapes attitude is so unbecoming. One more time, here's the deal. Just like in Iowa, what was awarded today were delegates to the County Convention, of which Senator Clinton won the majority. No national convention delegates were awarded. if the delegate preferences remain unchanged between now and April 2008, the calculations of national convention delegates being circulated by the Associated Press are correct. Foresaw a huge wave of new voters unlike in her failed Iowa campaign. Worked relentlessly to appeal to Hispanics from the ground up rather than the top down. Sewed up the support of many Culinary workers long before the union endorsed Obama. Dominated among women and then persuaded them show up to caucus. Won the final week of publicity with tough political gamesmanship. Update: The Las Vegas Sun crunches the numbers. (Las Vegas, NV) "The Nevada Democratic Party and its officials have taken great effort to maintain our neutrality in the presidential campaign and the integrity of our process. Today, two out of three Nevadans who caucused chose a Democrat instead of a Republican for president. That is an overwhelming majority vote for a new direction. Just like in Iowa, what was awarded today were delegates to the County Convention, of which Senator Clinton won the majority. No national convention delegates were awarded. That said, if the delegate preferences remain unchanged between now and April 2008, the calculations of national convention delegates being circulated by the Associated Press are correct. We look forward to our county and state conventions where we will choose the delegates for the nominee that Nevadans support." Source for numbers: MSNBC vote tally by county and Nevada Dems. Hillary won in other counties besides Clark. She also won in Lincoln, Lander, Lyon, Mineral and Nye. I feel like that's getting lost in the discussion. Bump and Update: A Democratic party official disputes Obama's claim he won more delegates. National delegates from Nevada won't be decided for months. The Washington Post has a similar report. The AP has the newest delegate count after the Nevada caucus results. Clinton won 13 delegates in Nevada on Saturday, compared to 12 for Obama, an AP analysis of caucus results showed. All of Nevada's 25 Democratic delegates have been awarded. Clinton leads the overall race for delegates with 237, including separately chosen party and elected officials known as superdelegates. She is followed by Obama with 135 and former Sen. John Edwards with 50. A total of 2,025 delegates are needed to secure the Democratic nomination. CNN calls Nevada for Hillary Clinton. 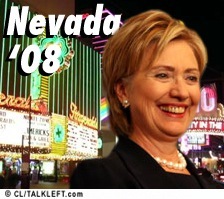 And, she won the majority of the at-large caucuses on the Las Vegas strip, despite the culinary workers endorsement. Clinton has carried at sites in the Flamingo, the Rio, Paris Las Vegas, the Bellagio, and Wynn Las Vegas. Only the site at Caesars has gone for Obama so far. First vote at the Mirage was 178 for Clinton and 153 for Obama and 3 for Edwards and three uncommitted. So on second round, that site, too, apparently will go for Clinton. The Luxor site is closely divided and voting again. No word from New York New York. Update: Harry Reid was right. Caucus turnout exceeded 100,000. Final at-large strip caucus tally: Hillary wins 7, Obama 2. With 91% of vote in, it's Hillary 51%, Obama 45%, Edwards 4%. In Clark County, it's Hillary 55%, Obama 44%. Update: Hillary has won 7 of 9 of the strip caucuses. Update: 1:17pm Hillary wins Nevada -- and takes the Las Vegas strip. Update: 1:05 pm PT: Hillary wins the Bellagio and the Tropicana caucuses. She has four of nine of the at-large caucuses so far. Update: 1:00pm PT 60% of precincts reporting and Hillary leads Obama 50% to 45%. Interestingly, with 58% of Clark County in, Hillary is leading Obama 55% to 42%. Update: 12:51 pm PT Obama has left Las Vegas for Chicago. He won't be making any remarks. I'd say that means he doesn't expect to win. 25% of precincts are in and Hillary is leading but not enough votes in yet to call the race. Bump and Update: ABC had Ron Paul beating John McCain. Now they say McCain is in second place. The Republicans started their caucuses two hours earlier than Democrats. Fox News and NBC have projected Mitt Romney the winner. Update: NBC has McCain second and Ron Paul third. CNN has them tied right now. The Washington Post in an editorial today castigates Nevada for choosing Saturday morning to hold caucuses when religious conservative and observant Jewish people and 7th Day Adventists will have to choose between their faith and their desire to participate in caucuses. 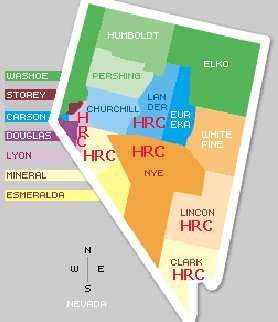 Anyone have a prediction for the Nevada caucus results? "Senator Clinton has some real structural advantages here," said Obama senior adviser David Axelrod. "She started off with a strong lead. They've run a very, very aggressive campaign. We recognize that there are significant barriers. I think it's going to be a very competitive race, but I think she has an edge going in." I hope Edwards makes a strong showing. I'd really like him to stay in the race. 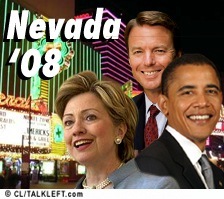 Update [2008-1-19 13:24:46 by Big Tent Democrat]: Romney wins Nevada. We've covered most of the stuff in this new Telegraph article about how Barack and Michelle Obama have attacked Hillary Clinton this week. This from the guy who voted "present" on at least 86 bills? An examination of Illinois records shows at least 36 times when Mr. Obama was either the only state senator to vote present or was part of a group of six or fewer to vote that way. In more than 50 votes, he seemed to be acting in concert with other Democrats as part of a strategy. What a joke. No wonder he laughed as he said it. Clinton has a long and substantial record of leadership fighting on behalf of working Americans and children, and it is this experience and her passion for creating a better country that would serve this nation so well. Our country needs someone who can be president from Day One after taking the oath of office. Her steadiness and resolve certainly would aid us in reestablishing better relations with other nations after Bush’s go-it-alone foreign policy, not to mention a thoughtful and responsible policy regarding our combat troops in Iraq. U.S. District Judge James Mahan has ruled against the attempt by the teachers union to block at-large precincts on the Strip. Mahan said he did not want to set a precedent that could affect other caucuses across the country and that the Democratic Party had the right to set its own rules. The Las Vegas Sun says no appeal is likely.